"Mars starts off on top of Venus; then it dances outward towards Earth," Cole Brown, a researcher at Penn State University, told his colleagues. Working with planetary scientist Darren Williams, also of Penn State, Brown modeled an early solar system where Mars started off in a warmer place. He found that the process was unlikely, but possible — just over 10 percent of the worlds starting out this way successfully worked their way out to where Mars orbits today. He presented the results in June at the 232nd meeting of the American Astronomical Society in Denver. The Martian surface is gouged by river-like features and spreading deltas, all of which seem to suggest liquid water once sat on the surface. At almost 4 billion years old, these features are almost as old as the planet itself, hinting that liquid water was short-lived on the Red Planet. Four billion years ago, the young sun was dimmer, shining at only about 75 percent of its current brightness. By itself, the newborn star wasn't hot enough to keep Mars warm if the planet were sitting in its current orbit, an average of 142 million miles (229 million kilometers) from the sun, about 1.5 times as far as Earth (1.5 astronomical units, or AU). For the planet to have been warm enough to hold water, an atmospheric blanket would have been required, Brown said. With a significant greenhouse effect, an atmosphere would allow the Red Planet to keep liquid water on the surface. Over time, researchers assume that the atmosphere was lost; spacecraft such as NASA's Mars Atmosphere and Volatile Evolution (MAVEN) mission are hunting for clues about the disappearing atmosphere. But Brown wasn't content with this solution. "There may be another way to accomplish this result [of liquid water]," he said. Brown and Williams noticed that the region near Venus would have been about the right temperature for a planet to hold on to water when the sun was young and dim. Using computer models, they found that the two planets could have evolved together over the course of about 100 million years — a brief enough time for liquid water to form on the surface. The two worlds would have remained tidally locked, keeping an unchanging face pointed toward each other for that brief period of time, until instabilities in their orbit finally drove them apart. After the escape, Mars would have passed near Venus for multiple orbits. Gravity would have driven Venus inward and sent Mars spiraling outward. In this setting, it wouldn't have taken long for the Red Planet to interact with Earth — and that's where things get difficult. In the first simulations of this scenario, gravitational interactions with Earth managed to drive the Red Planet out to its current position. But Brown and Williams noticed that the Red Planet occasionally came within 40 Earth radii of our planet — closer than the orbit of the moon. Unfortunately, the original models didn't include a moon, so they didn't chart the potential chaos. So, the pair went back and included a moon in the next iteration. "It's kind of like if you shot a Mars cannon at the Earth-moon system," Brown said. The pair ran 10,000 simulations with Mars entering the system at various speeds. They found that the closer Mars came to Earth's surface, the more likely it was to affect the moon — sometimes even driving it out of the system completely. In these simulations, only rarely did Mars come in close enough to affect the system, but "it's a risk we need to be aware of," Brown said. The close encounters raised some interesting questions. The leading theory for the moon's origin involves a Mars-size object colliding with Earth early in the life of the solar system. The collision would have carved out a chunk of the terrestrial surface that, along with the fragments from the impactor, coalesced into the moon. The process is similar to the one simulated by Brown and Williams, though without the catastrophic impact. "This almost tells that story, but it does not," Brown said. The odds are slim that Mars started out near Venus. 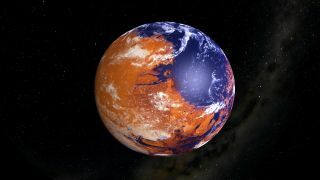 In more than half of the simulations, a traveling Mars collided with either Venus or Earth, which would have obliterated the Red Planet and any signs of water on the surface. Nearly 20 percent of the time, the Red Planet was ejected from the solar system completely, while another 10 percent of the time, it was tossed into the sun. Only 13 percent of the time was it able to successfully dance between Venus and Earth to arrive at its current position. For now, the researchers are continuing to explore ways that Mars could have successfully moved into the outer solar system and whether Mars and Venus could have been stable while tidally locked.